It was a day that I felt drawn to visit my cousin Christy’s grooming shop. That day she was bathing a dog in the back and was having a difficult time. The dog was frightened and was trying to nip. I took the dogs face in my hands and spoke gently to her telling her that it would be okay. I soothed her through the whole bath and the eye contact was what said it all! Christy saw the conection too! 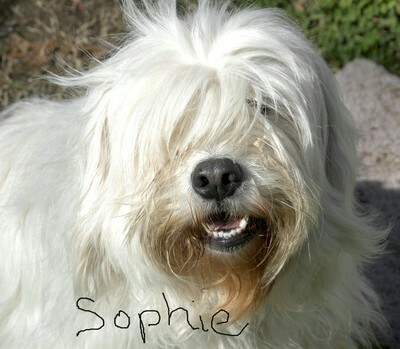 She mentioned that she was grooming for the humane society that day and that Sophie needed to be adopted. I called and talked with them about her! They did not feel that I was the right fit for some reason. I begged! Finally, two weeks later, Sophie came home. She has been my shadow every day since. She is smart, and loyal, and so much love in my life! I could not imagine her not being with me! She was definitely a kindred spirit. It was fate! I know it and she knows it too!